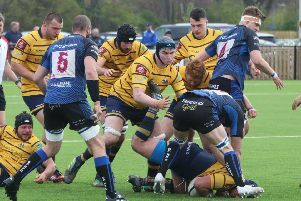 Worthing Raiders Rugby Club brought a ten-match National League 2 South losing run to an end at Roundstone Lane this afternoon. Second-bottom Raiders ran in five tries to ensure they secured a thrilling bonus-point 32-28 victory over two-places above Barnstaple. Heading into the latest round of fixtures six points from safety, Worthing's win - coupled with bottom-side Exmouth beating third-bottom Barnes - helped Raiders closed the gap on safety to three points. Going into the game on the back of ten straight defeats, Raiders needed to start well and they did just that. Harry Forrest - who would go onto to complete a hat-trick of tries - burst through before going over inside five minutes. Worthing started in flying fashion and they notched a second try less than ten minutes later. Another fine move saw Finlay Coxon-Smith race away, then find Forrest who surged over for his second of the afternoon. Making up for his earlier miss, Matt McLean converted as the home side went 12-0 ahead. Barnstaple bounced back on the 20-minute mark with a converted try from Isaac Hydleman bringing them back to within five points of their opponents. Raiders then ran in two tries in a matter of four minutes to open up a sizeable lead just after the half-hour. First, calamitous defending saw Coxon-Smith capitalise after Hydleman totally missed the ball on his own try-line. Then less than four minutes later, Kariym Iriving went over as Raiders opened up a 24-7 advantage five minutes before the break. Looking in command, Worthing gifted Barnstaple a way back three minutes later. Steven Perry latched onto Jacob Murphy's grubber-kick as the travelling side trailed by ten-points at half-time. Just as in the opening 40 minutes, Raiders were off to a blistering start in the second running in eight unanswered points. McLean crashed over a penalty less than five minutes after the restart then, a converted hat-trick try from Forrest, helped Worthing surge into a 32-14 lead before 50 minutes were on the clock. Having struggled to closed games out all season, Worthing faced a nervy finale with Barnstaple nearly pulling off a late comeback. Matthew Gohl - who hadn't appeared to touch down - saw his try converted as Barnstaple closed the deficit to 11-points with 20 minutes left. Raiders were under constant pressure for the final 15 minutes with Scott Barlow shown a yellow on 75 minutes, meaning the home side would finish with 14. Jordan Petherbridge then converted his own try two minutes from time as Barnstaple closed to 32-28. However, resilient work from Worthing in the final seconds helped them bag a first league win in 11 matches. Raiders are back at home next Saturday with third-placed Old Elthamians coming to Roundstone Lane. RAIDERS: Storer, Watson-Brooks, Gatford, Barlow, Lake, Lamb, Hewick, Perkins; Leeming, McLean, Irving, Loosmore, Richards, Coxon-Smith, Forrest. Replacements: Gearing-Grief, Sargent, Whittall, Wilcockson, Boyland.